Today's tip is about using layers in your photos. For those of you familiar with Photoshop and what a layer is, that isn't what I'm referring to here. I'm talking about using different 'layers' in your photos in order to establish perspective, visual interest, and to lead attention to whatever is the main subject of your photo. In the photo below, there are at least two layers clearly visible. 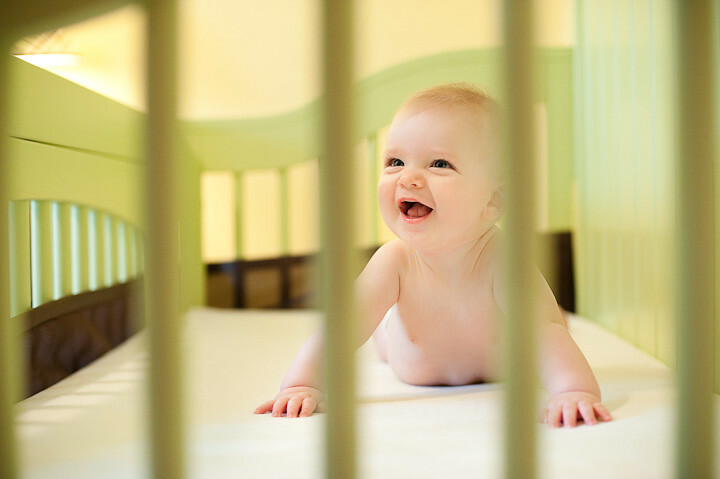 The first is the out of focus layer of the crib bars. Then the second layer is the in-focus adorable baby. This photo gives you the impression that you are looking in on his life, creating a strong feeling of privilege and intimacy. The next photo has two clear layers as well. 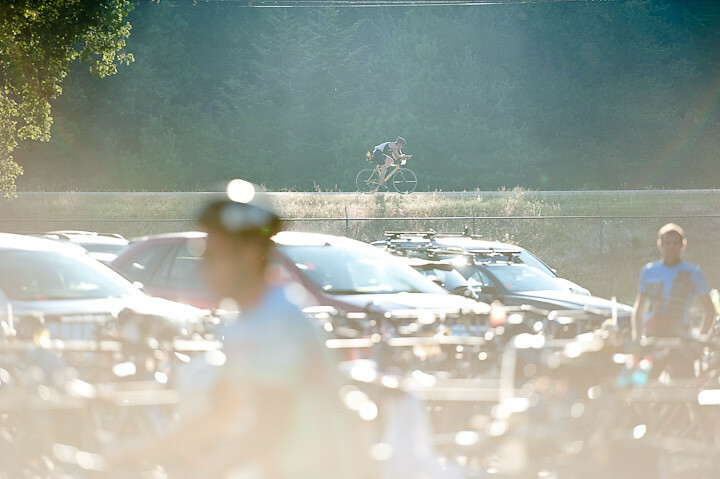 The foreground layer - all of the bikes and other triathletes, and the background layer - which in this case is where the subject of my photo is: Matt starting the bike portion of his half-ironman race. The out of focus foreground gives perspective to the photo and helps to lead your eye to the subject - Matt. The next photo has multiple layers, that help to lead your eye to the beautiful bride, getting ready for her wedding. 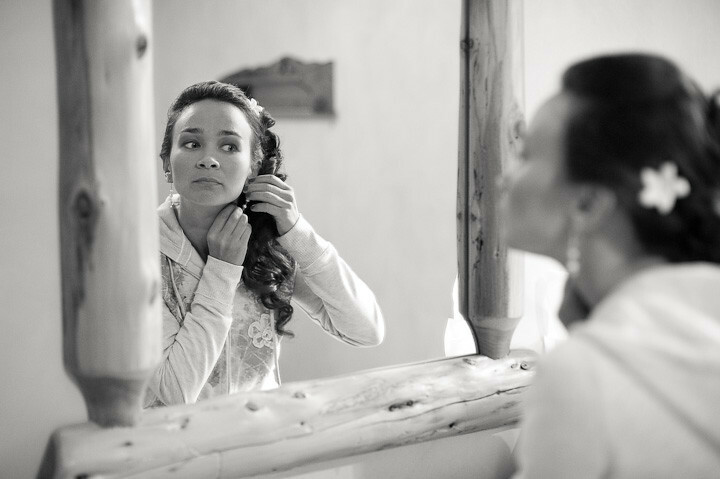 The left side of the mirror and the actual bride herself become out of focus and frame her reflection in the mirror, which is the main focus in this photo. The final photo has at least three different distinct layers in it. There is the first layer, the green shrub that is out of focus on the left side of the photo. Then, the couple is the main focus and is the middle layer. The third layer is the out of focus background. Because this photo has three different layers, it really helps to draw your attention to what is in focus - the bride and groom, and it adds visual interest and depth to the photo. Try to incorporate layers into your photos. Try shooting through or around things - tree leaves, branches, other people, doorways, etc. Use these to create out of focus foregrounds that draw attention to your subjects. If you aren't sure how to make the foreground or the background blurry, you can check out an in depth explanation on aperture here, and a simplified tip on how to blur your background here. Stay tuned next Tuesday for another Love Your Camera: Weekly Photography Tip!